This entry was posted in Papers and tagged artificial language learning, Basque, Cantonese, creole, cross-linguistic, focus, Guarani, Kaqchikel, Khalkha, language, language processing, Language production, lexical processing, lexical production, Maltese, Mandarin, morphological processing, morphology, Palenquero, psycholinguistics, Raramuri, redundancy, sentence processing, sentence production, Setswana, special issue, tone, Turkish, Tzeltal, Vietnamese. A few days ago, I posted a summary of some recent work on syntactic alignment with Kodi Weatherholtz and Kathryn Campell-Kibler (both at The Ohio State University), in which we used the WAMI interface to collect speech data for research on language production over Amazon’s Mechanical Turk. Jaeger and Grimshaw (2013). 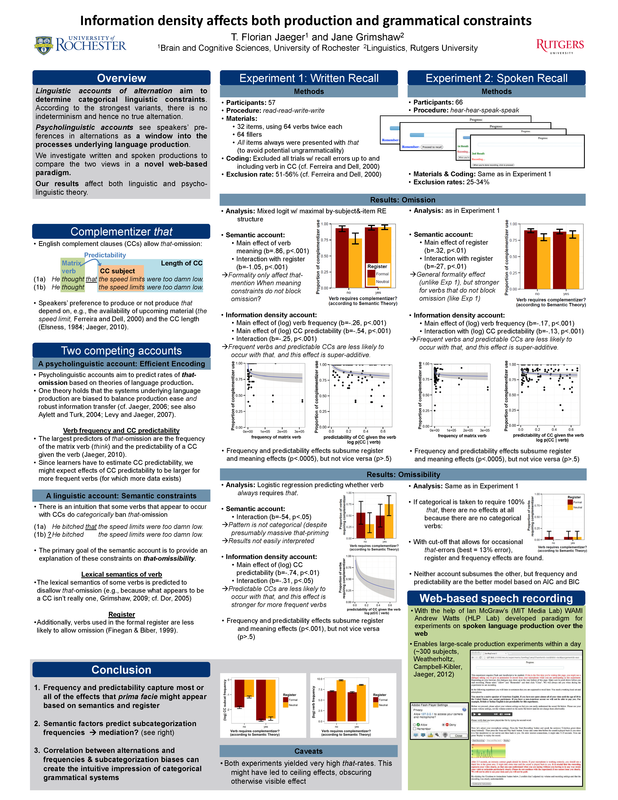 Poster presented at AMLaP, Marseilles, France. This entry was posted in Papers, Presentations, etc., Preliminary, presentations, Results, WWW experiments and tagged AMLaP2013, complement clauses, complementizer, Jane Grimshaw, Language production, Mechanical Turk, sentence recall, that-mention, uniform information density, WAMI. The Human Language Processing (HLP/Jaeger) Lab in the Department of Brain and Cognitive Sciences at the University of Rochester is looking for PhD researchers to join the lab. Admission is through the PhD program in the Brain and Cognitive Sciences, which offers full five-year scholarship. International applications are welcome. This entry was posted in For students, graduate studies, HLP lab and tagged adaptation, artificial language learning, functionalism, funding, graduate program, graduate studies, implicit learning, inference, language chance, Language production, lexical production, phd, phonetic adaptation, phonological encoding, psycholinguistics, recruiting, sentence processing, sentence production, speech perception, syntactic priming, typology, uniform information density. 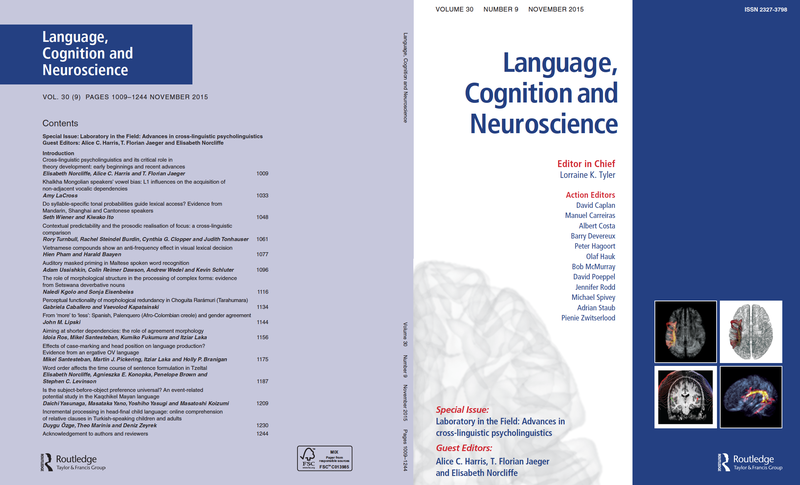 The last two papers based on Katrina Furth’s and Caitie Hilliard’s work back when they were at Rochester just came out in the Journal of Experimental Psychology: Learning, Memory, and Cognition and the journal Frontiers in Psychology. The JEP:LMC paper investigates how lemma selection (i.e., word choice) is affected by phonological overlap. We find evidence for a (weak) bias against sequences of phonologically onset overlapping words. That is, when speakers have a choice, they seem to prefer sentences like “Hannah gave the hammer to the boy”, rather than “Hannah handed the hammer to the boy”. This suggests very early effects of phonology on lexical production, which seem to be incompatible with strictly serial models of word production. This entry was posted in articles, Papers, Presentations, etc. and tagged Caitlin Hilliard, data analysis, fluency, inhibitition, interference, Katrina Furth, Language production, mixed models, phonological encoding, phonological onset overlap, random effect structure, speech rate, word order.